You'll name this tuna casserole healthy. Combined with only the most balanced ingredients, you can dive into this dish without the residual guilt. Preheat oven 350 degrees. Prepare shells according to package directions. Lightly coat an 8x8 inch baking dish with cooking spray. 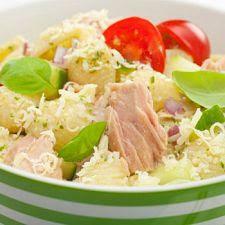 Place cooked pasta in baking dish and add tuna, soup, milk and peas; mix well. Bake uncovered until the casserole begins to bubble; about 20 minutes.